Recently I (John) published a post over on my personal site titled “Does a startup really need its .com?” Obviously we don’t think so (judging from our domain name), but think that what is more important is consistency in branding. 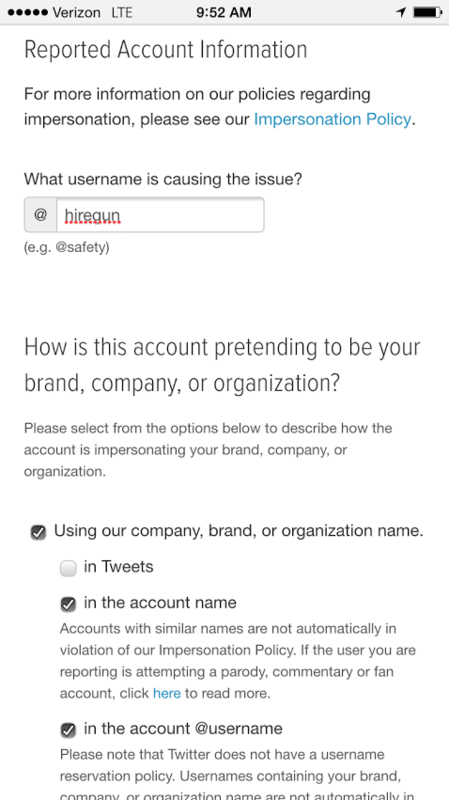 While writing that post and looking at all of our profiles, I realized that we had “HireGun” for all of our social media profiles except Twitter, where we used @hiregunco because @hiregun was taken, though dormant. In the interest of shipping and establishing a Twitter presence, we went with that and started building a social presence (still small at this time, but more than Twitter’s median of 1). 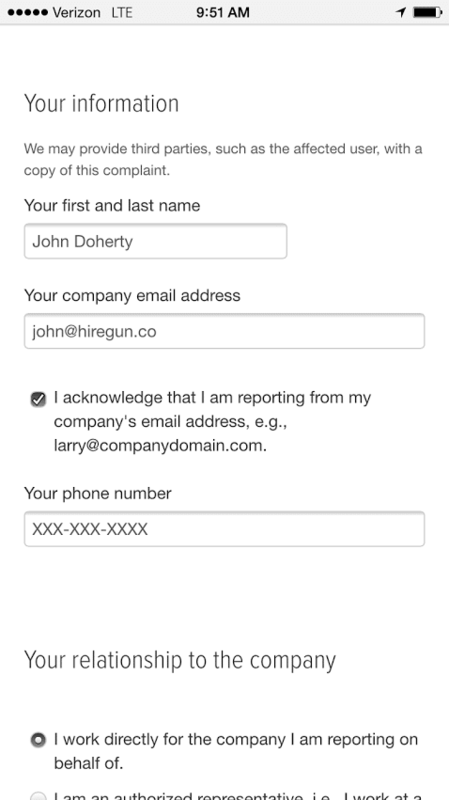 I realized that by having just @hiregunco though, when Facebook/Google+ and our domain were HireGun, I was being inconsistent with my own advice. 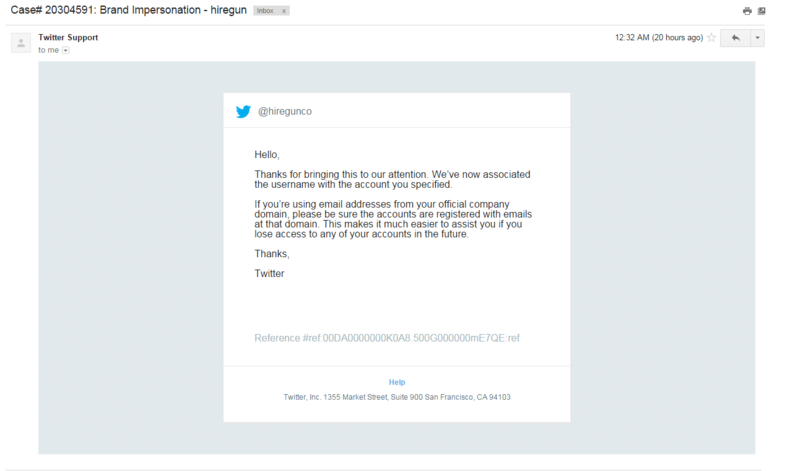 As of overnight while I slept, our Twitter handle switched over from @hiregunco to @hiregun. Here’s how I did it. I’ll admit, I didn’t do a lot of research into why @hiregun was taken when launching the service. When I looked at it, I saw that it was a “personal” dormant account used to post make money online tweets, but only two of them and not since 2013. An opportunity! 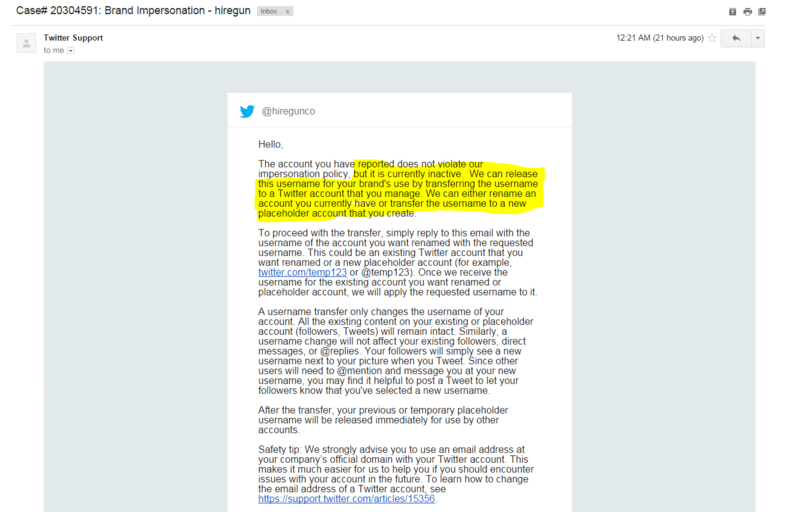 It would have been significantly harder to get the handle had the account not been dormant. 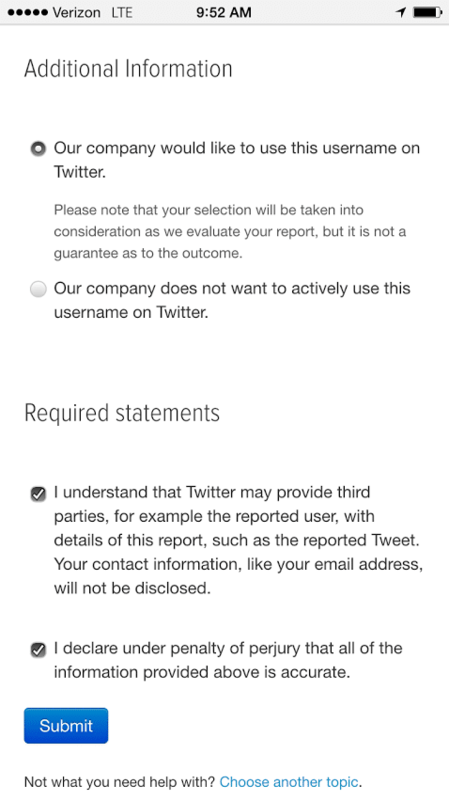 Next I went to Twitter’s provided impersonation form and filled out the needed information. 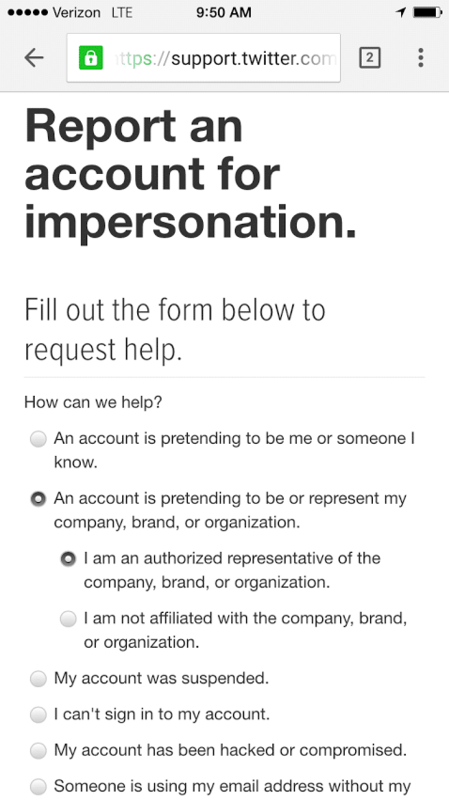 Note that I filled out the impersonation form and have the .co and a very similar account (and other social media profiles at HireGun). 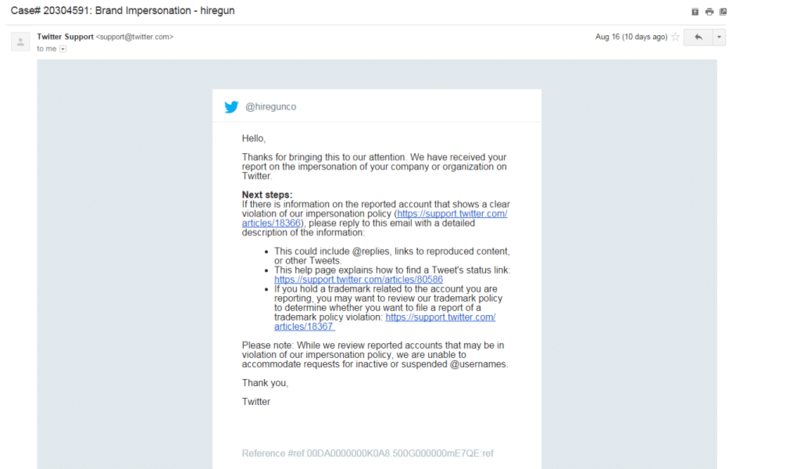 However, as you will see, they gave it to me because it was inactive, not because of impersonation. I do have to wonder if having the .com would have made a difference. The second was to alert me that while they couldn’t give it to me for impersonation (again, not sure why), it was dormant so they could release it to me. 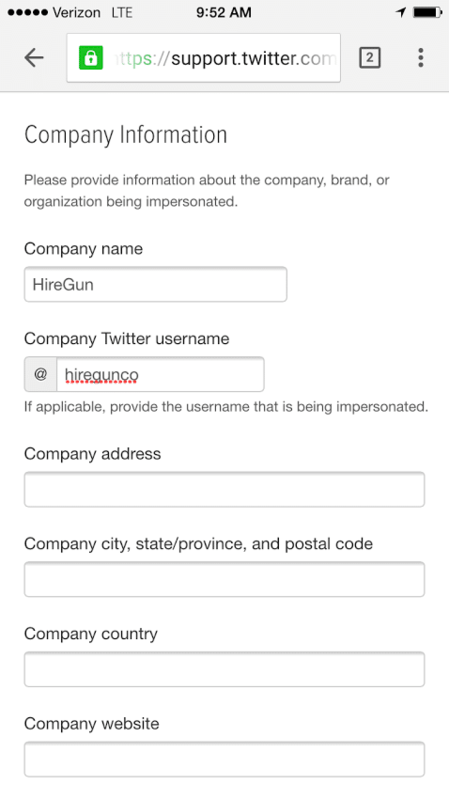 I asked them to make @hiregunco into @hiregun. Your mileage may vary, as each case is different, but in my case it worked out! First, do your research. 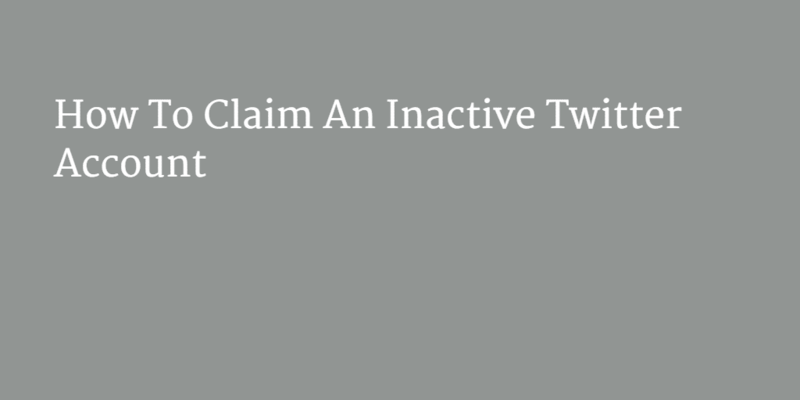 If you’re trying to claim an inactive account, you’ll have an easier time than trying to claim an active account. If it’s active and impersonating your business, it may help to have the .com domain. Second, after you move your old account over to your new name, go back and claim your old Twitter account as well and put up a bio saying that the account has moved to the new account. If you’ve put any time into building your old account, you’ll likely still get some type-in traffic and should get them over to your new account. Good luck! Tweet us @getcredo with your experiences!